Thread: How to become a Microsoft MVP. The Microsoft Most Valuable Professional (MVP) Award is an annual award that is given to outstanding members of Microsoft's peer-to-peer communities, and is based on the past year's contributions those members make in those communities online and offline. Individuals are nominated to be considered for MVPs by their peers or Microsoft based on activities in the offline or online technical communities. The MVP Program and annual award is based solely on an individual's contributions from the previous year and those contributions are then compared amongst the other candidates for any given nomination cycle to determine who will be awarded. To know more, see the FAQ. 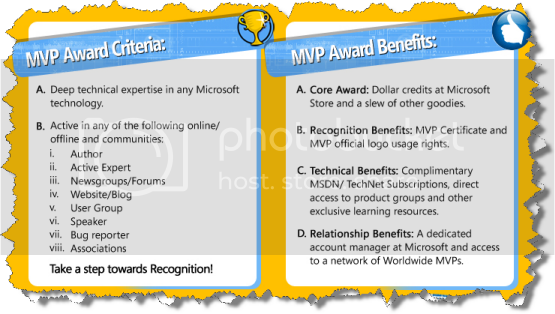 As you are aware, we will nominate deserving members from any part of the world for the Microsoft MVP award. One of our nominee's tweakwindows, iMav, nitinagarwal, have been selected for this Award. We had earlier mentioned that Microsoft was actively looking for more MVPs in certain countries, which included India. While a nomination by a MVP or an reputed community does carry weight, if you feel or wish, you can also nominate yourself for this Award. Currently, Microsoft India is actively looking for good technical community leaders to be considered for the Microsoft MVP Award. So, if you feel you fit the bill and if you have been actively contributing to online or offline technical communities over the past year, here is your chance to get recognized. 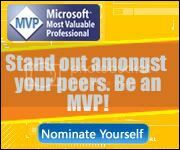 Nominate yourself for the Microsoft MVP Award - a program that recognizes exceptional technical community leaders from around the world who voluntarily share their high quality, real world expertise with others. Go here for more on this. To know more about the Microsoft MVP Program in South Asia, go to http://microsoft.com/india/mvp. This FAQ at the global MVP website may also interest you. Go here for a detailed post on How to become a Microsoft MVP or MCC. Well i saw this same in another site ..Nominated myself lets c how it goes,....and newaz WVCF is ther na ..
Canada has 172 MVPs as of April 1st...we could use a few more too, I guess! gr8 chance to be a UG Lead. See The Microsoft MVP Award Program Blog for some highlighted MVP accomplishments.